Ivan Botha is a popular South African Actor, Writer, Director, Producer, MC, and also a Presenter. 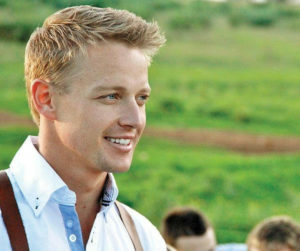 He is known for the role he played as Pieter van Heerden in 7th Avenue, and also for his appearance in Afrikaans-language films, including Road to Your Heart (2014), Superhelde (2011) and Bakgat! (2008). He is graduate of the Tshwane University of Technology where he bagged a drama degree and fully specialized in direction and script writing. He made his acting debut in the horror movie The Raven, which was directed by David DeCoteau, and has ever since appeared in the Bakgat! series and the television show Getroud met rugby. He was born on the 13th of December 1985 in South Africa. As of 2018, he is 32 years old. From his former marriage to Ciske Kruger, they had one daughter together. Botha and Kruger have since been divorced. He is married to South African actress, film producer, scriptwriter and model Donnalee Roberts. Their engagement was in May 2017. Ivan popped the question in The Netherlands because of Donnalee’s connection to the country. Information of the net worth of Ivan Botha has not yet been gathered and we will update as soon as possible. Path to your heart, 2014 as Basson Jr.